If you spend any time at all picking up hickory nuts or acorns in the fall you have probably noticed acorns and nuts with a neat, small round hole through the side. This is the exit hole created by the pudgy, white, wrinkled, legless grub that developed inside the nut. 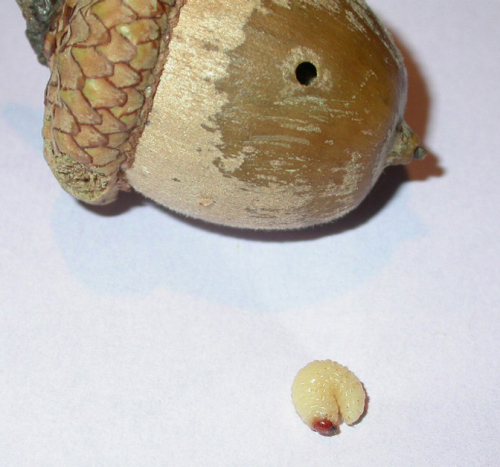 There are several species of insects that live inside nuts and acorns. The most common are closely related weevils collectively referred to as “nut weevils." Nut weevils attack the developing nuts on the tree during mid summer. The female adult weevil lays her eggs inside the immature nuts. The egg hatches into a creamy white, grub-like larva that feeds inside the nut until fall. The larva grows to 1/4 to 3/8 inch in length as it eats the entire contents of the nut, making it worthless. The fully-grown grub chews a perfectly round 1/8 inch hole in the side of the nut and emerges in late fall or early winter. Outdoors, these larvae tunnel into the soil to complete development. They remain in the soil for one to two years before emerging as a new adult weevil to repeat the process. Control of nut weevils in backyard oak and hickory trees is not practical. Nut growers use insecticide applications similar to the apple growers to prevent egg-laying by the female weevils, but this is prohibitively costly for the homeowner. For more on nut weevils as household pests, see the ISU Yard and Garden Column from September 24, 2007. Acorn weevil emergence hole and grub. Photo by Laura Jesse. Links to this article are strongly encouraged, and this article may be republished without further permission if published as written and if credit is given to the author, Horticulture and Home Pest News, and Iowa State University Extension and Outreach. If this article is to be used in any other manner, permission from the author is required. This article was originally published on October 8, 2008. The information contained within may not be the most current and accurate depending on when it is accessed.